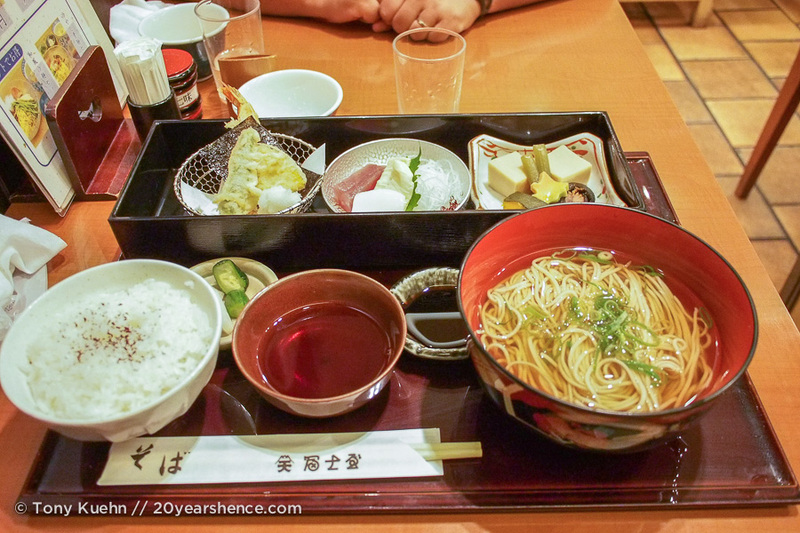 By the time Tony & I reached Kyoto, we had hit our stride when it came to dining out in Japan. Gone were the meltdowns and apprehension about our lack of Japanese producing an insurmountable barrier for us when it came time to meeting our hunger. 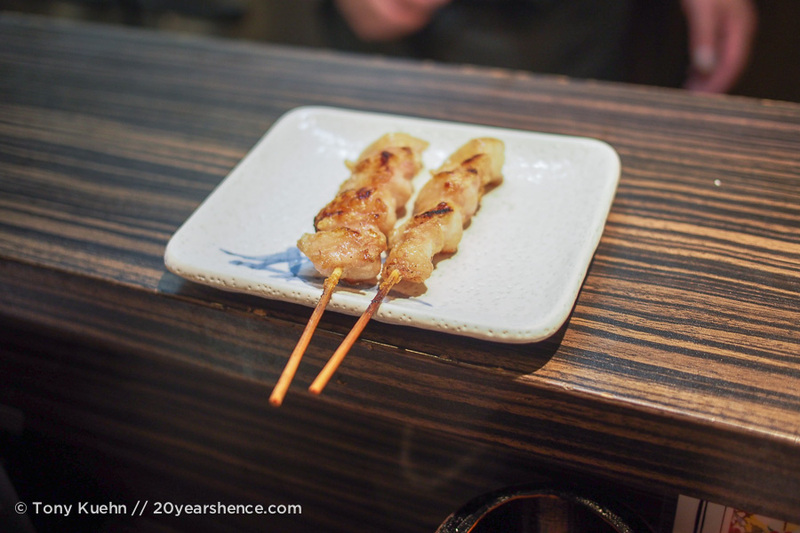 It may have taken us half our time in Japan to get it right, but after some trial and error, we did get to a point where we were exceedingly comfortable with dining out and our time in Kyoto surely benefited from that. 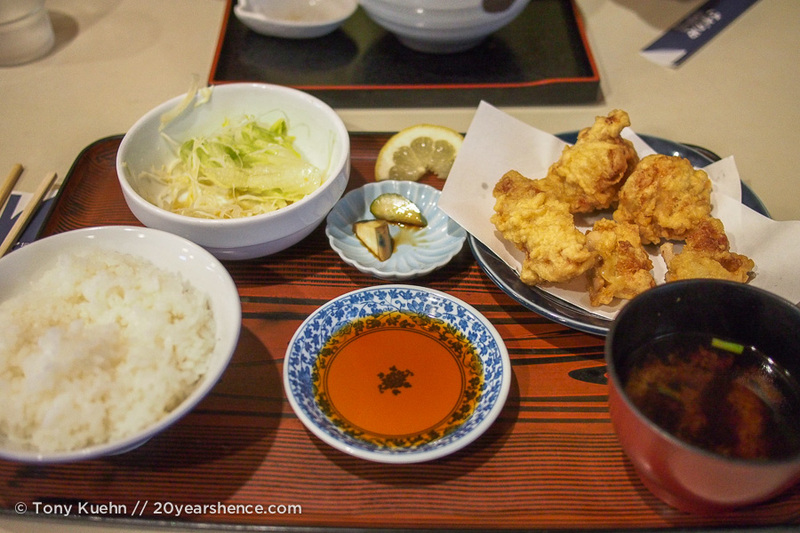 One of the biggest revelations we had about eating in Japan is that the rumors really are true: there are ample delicious and cheap eating options available to diners in department stores and train stations. Prior to this discovery, we were frequently limiting ourselves to one proper meal per day at pricier establishments, and then heavily supplementing with snacks purchased at convenience and 100 Yen stores (which are not to be scoffed at, but there is only so much onigiri and inarizushi a gal can eat!). Discovering the cheap eats that can be found underground changed everything for us! Kyoto in particular has an exceptionally impressive array of underground shopping and eating warrens, which is particularly convenient when temperatures above ground are soaring but you’re in the mood to browse a bit. 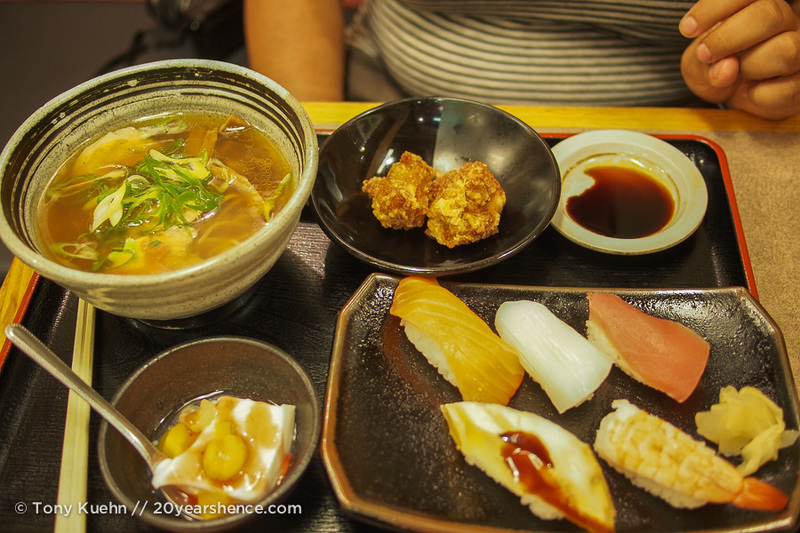 We spent a lot of time wandering around an underground mall right near the main train station called Porto, and enjoyed several scrumptious meals there, such as these fantastic tempura & soba combos that we ate for lunch one day. 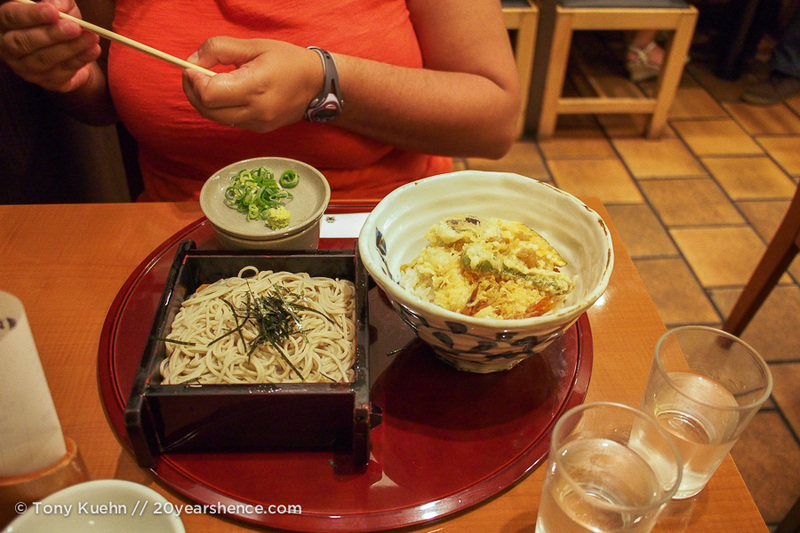 We also had our sole ramen experience in one of these subterranean restaurants. I have no idea why this was the only time we ate this dish (probably because we were too busy eating tonkatsu & tempura the rest of the time! ), as it was really delicious. Unable to pick just one thing, I ordered a combo that came with a salty miso ramen, a few nuggets of fried chicken (seriously, Japanese fried chicken is AMAZING), some sushi, and an almond custard & fruit dessert. I won’t lie: all of the items in this set were worth ordering in their own right, but I totally ordered this set just because I wanted the dessert! Tony was a bit less frivolous in his choice, and opted for an extremely hearty bowl of ramen. 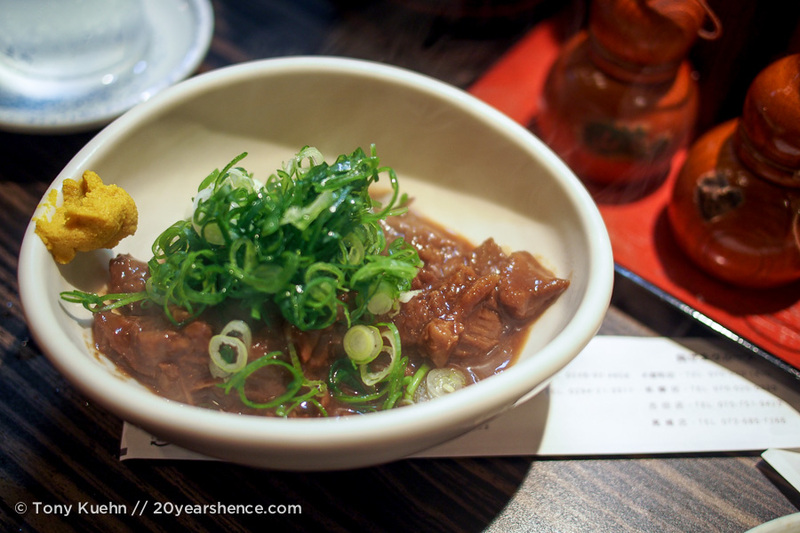 But this wasn’t your ordinary pork ramen… oh no! Instead, it was gussied up with yuba wrapped prawns and yuzu-infused noodles. It was SO delicious that, dessert or not, he was clearly the winner when it came to that meal (and, amazing wife that I am, he still had a few bites of dessert anyway!). 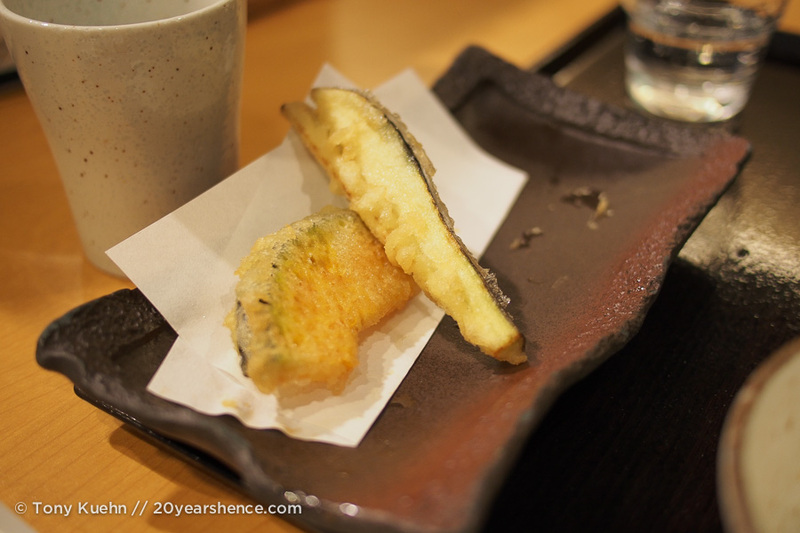 Great food in Kyoto is not limited to some kind of underground movement. No, fantastic food can be found on the top floor of many department stores as well (and fancy places like Isetan (the mall attached to the train station) have not one, but TWO food floors). If the thought of eating in a department store calls to mind memories of North American food courts, get rid of those images, because the food and service in these places couldn’t be more dissimilar. Apart from the location, dining in department stores is just like eating at a street-level restaurant. 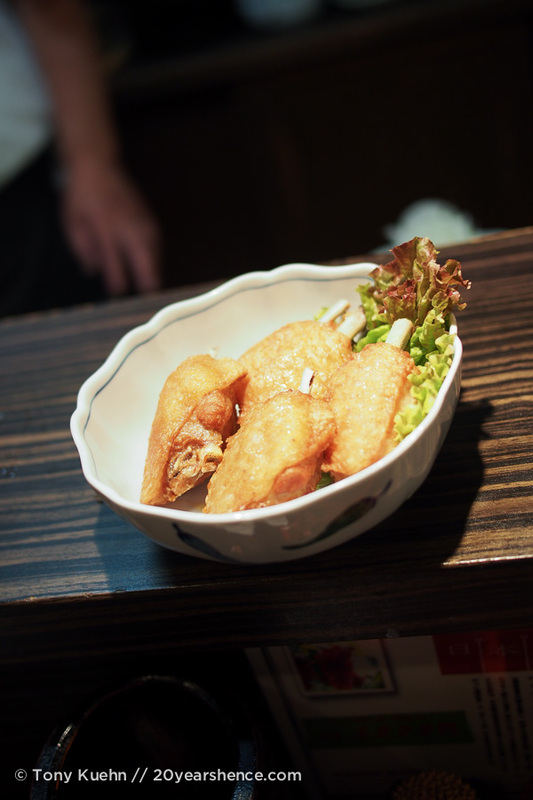 Given the Japanese obsession with striving for perfection, many restaurants will focus on a single style of food, such as tonkatsu or sushi. 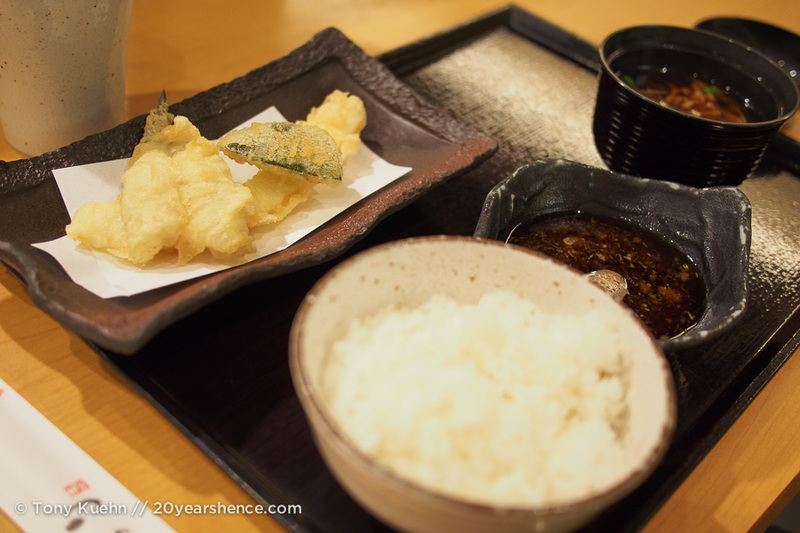 Our foray into the world of department store meals in Kyoto took us to a restaurant that specialized in tempura. 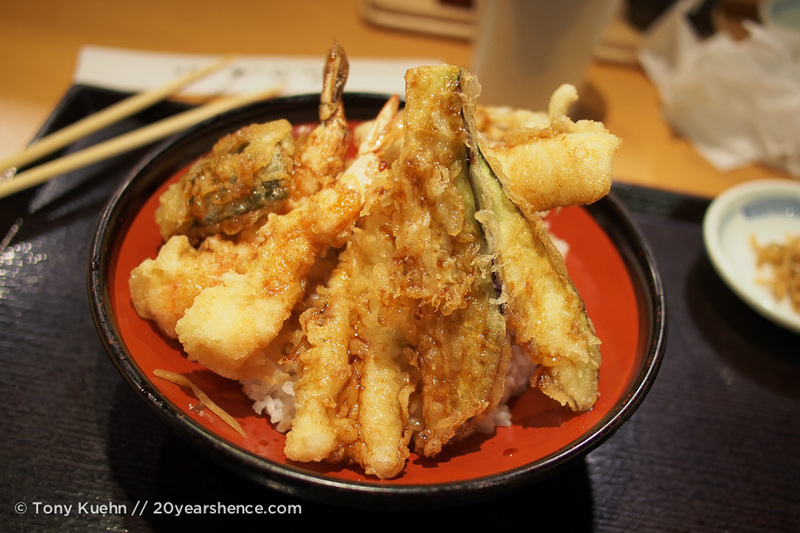 Unsurprisingly, it was some of the best tempura we have ever had – every morsel that we ate was perfectly cooked and the batter was impossibly light and crispy, and not at all greasy. Although Tony’s set came out all at once, for some reason, my tempura was cooked a la minute in front of me so that each piece I enjoyed was as fresh as possible. I wouldn’t go so far as to claim this was a healthy meal, but it’s probably the healthiest version of the dish you’re apt to find. Particularly highlights here were the remarkably meaty mushroom in Tony’s set, the perfectly flakey white fish in mine, and the eggplant that is the stuff of dreams that we were both lucky enough to get (though mine came out on its own at the end… it’s as though it knew it was a culinary star!). Not all of our meals were so highbrow, however. 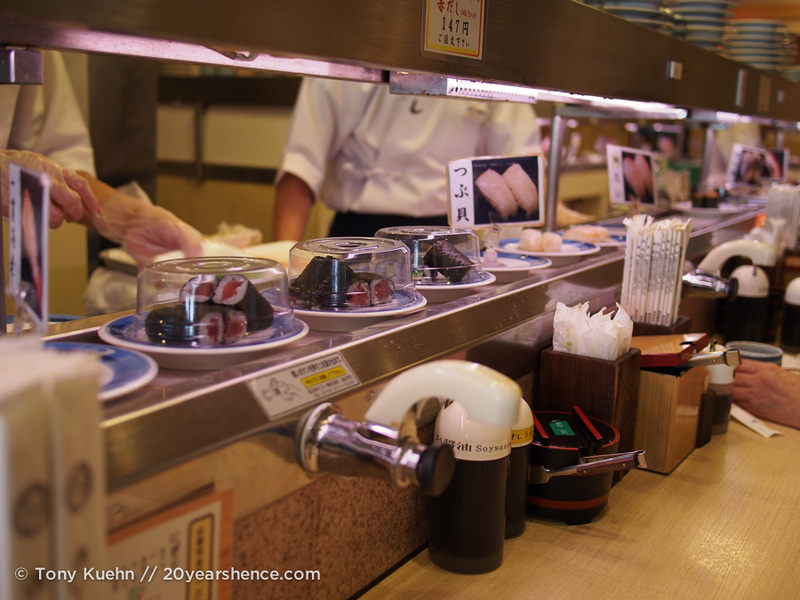 During our time in Kyoto, we made a point of dining at a kaiten sushi restaurant. That’s right, we ate conveyer belt sushi in Japan! 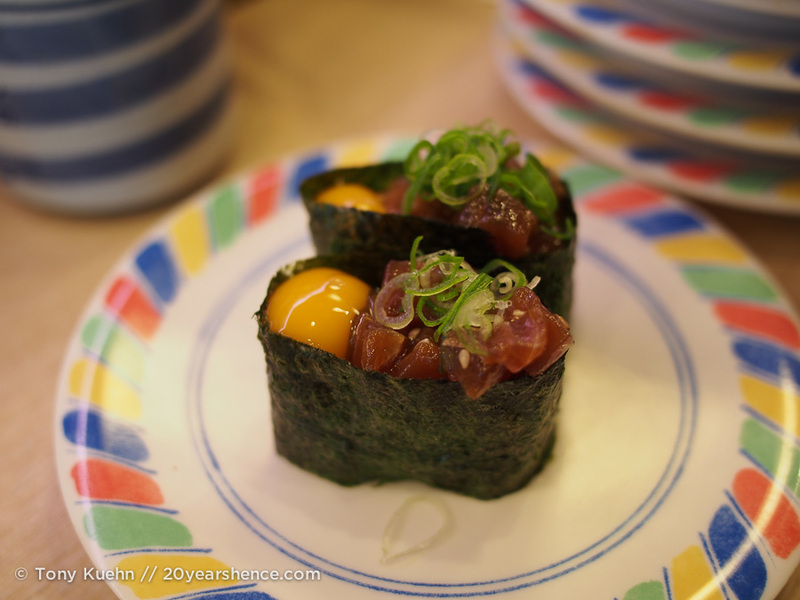 A sampling: This was raw egg and tuna, delicious! Surely the blend of fish & technology is the epitome of all things Japanese! We had tried this style of dining once in San Francisco, solely for the novelty of it. While I am sure the sushi we had here was no where near the best of what is on offer in Japan, it was still really yummy (and fresh! We watched the chefs hands fly as they made rolls and placed them on the belt at a rate that was difficult to keep pace with!) and of cheap. Also, lest you let your fear that this kind of food is only eaten by eager tourists who don’t know any better dissuade you from trying out kaiten sushi, we were actually the only foreigners in the restaurant, and the joint was jumping with locals. 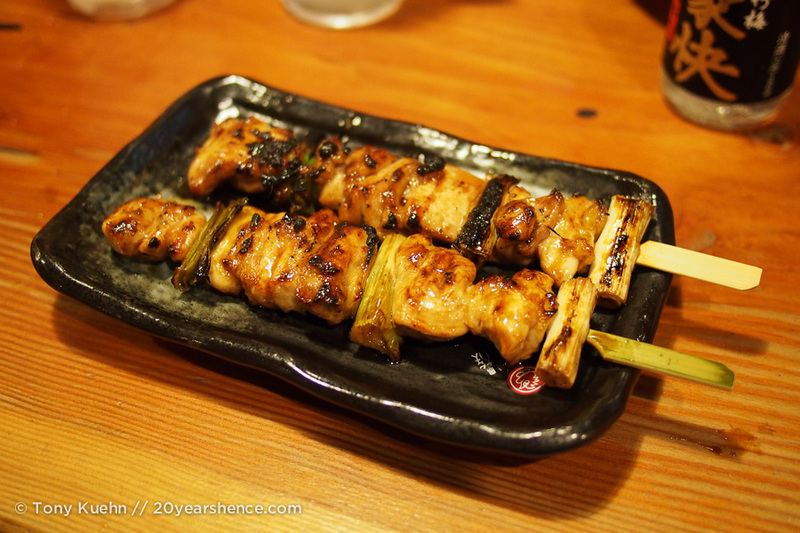 We also spent quite a bit of time dining in Yakitori restaurants, where the name of the game is pretty much skewering and grilling things. One of our favorite places that we found listed everything (including booze!) for just 280Y per order. 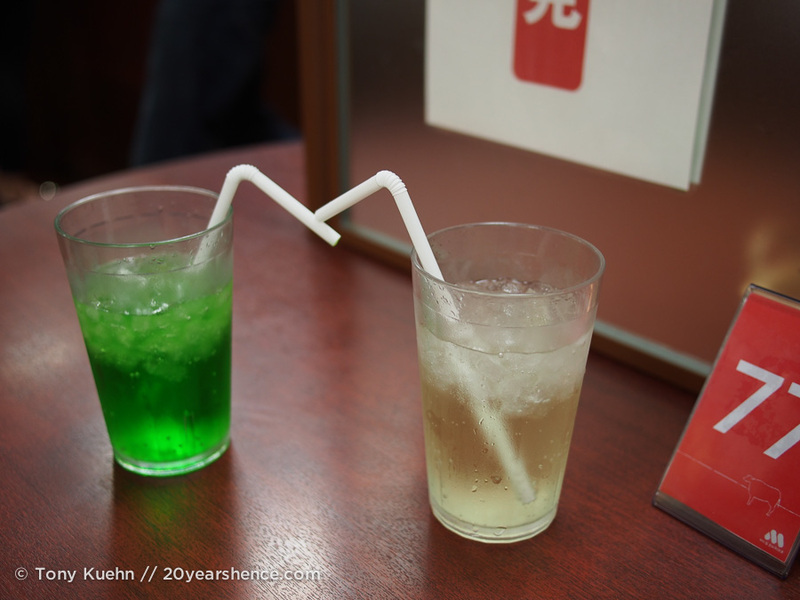 This was mind-boggling, as in Japan, it is not uncommon for a beer to go for 400 – 600 Y. With prices this good, we went on a bit of a bender and each had 3 drinks apiece! Tony tried a variety of beverages, but I stuck with the delicious sours + grated white peach combo all night long and did not regret it… well, not until the next morning, that is! 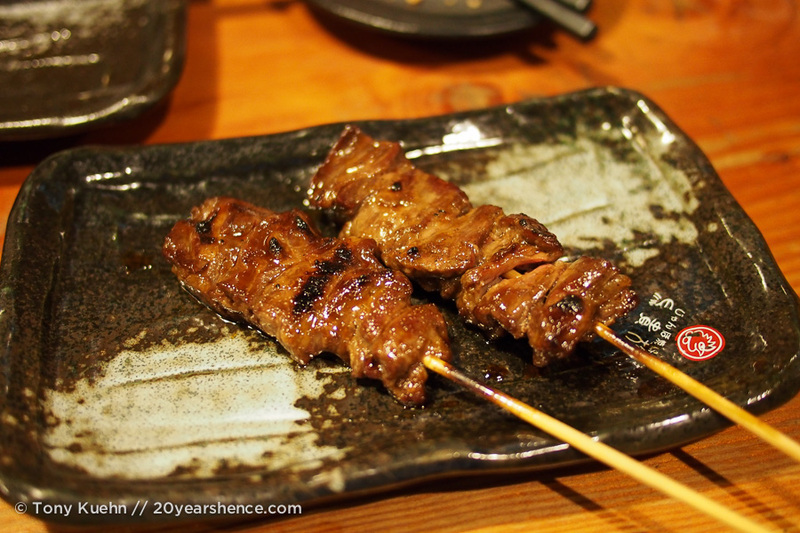 Along with the cheap drinks, the restaurant served up incredibly friendly service and amazing succulent yakitori. We enjoyed a variety of chickeny skewers, as well as one beef one, and they were all cooked to perfection and insanely juicy. But seeing how we were living on the edge, we also went ahead and ordered some deep fried camembert (it wasn’t actually camembert, but it was still gooood), these genius chicken springrolls, in which the chicken SKIN was used as the wrapper for the filling, and—of course— an order of fried chicken. 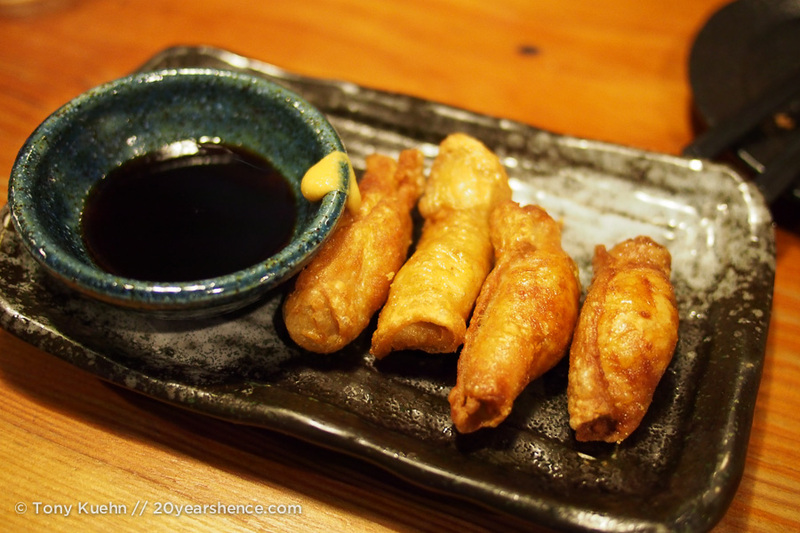 Chicken spring rolls, the wrapper is chicken skin! I know this seems like an insane amount of food, but it’s Japan and portions are small, I swear! Plus, if you’re going to splurge, you might as well go big or go home! 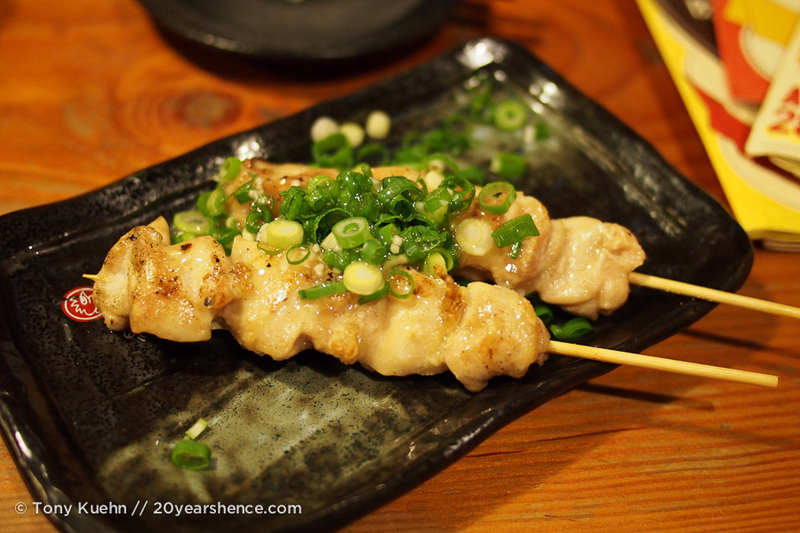 On a separate evening spent wandering down Pontocho Alley (another one of Kyoto’s geisha districts) peeking into the little bars and restaurants, we ventured into another yakitori joint, this one a little less boisterous, but perhaps even more delicious. The owner had limited English, but he was SO kind and helpful; he and his sous-chef were very eager to chat with us and practice their English, as well as help us expand our ever-growing Japanese vocabulary. 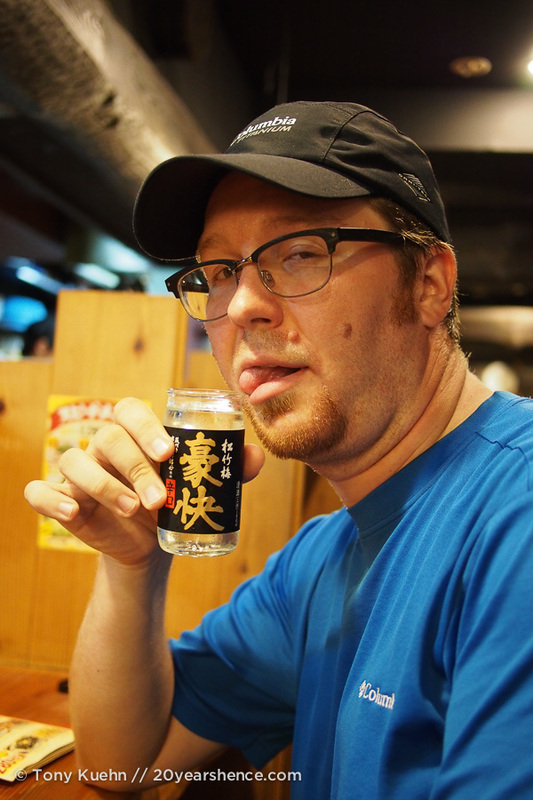 We tried several delicious sakes here, and were introduced to a new concoction called kajitu, which is a blend of sake & rum, and is lethally delicious! 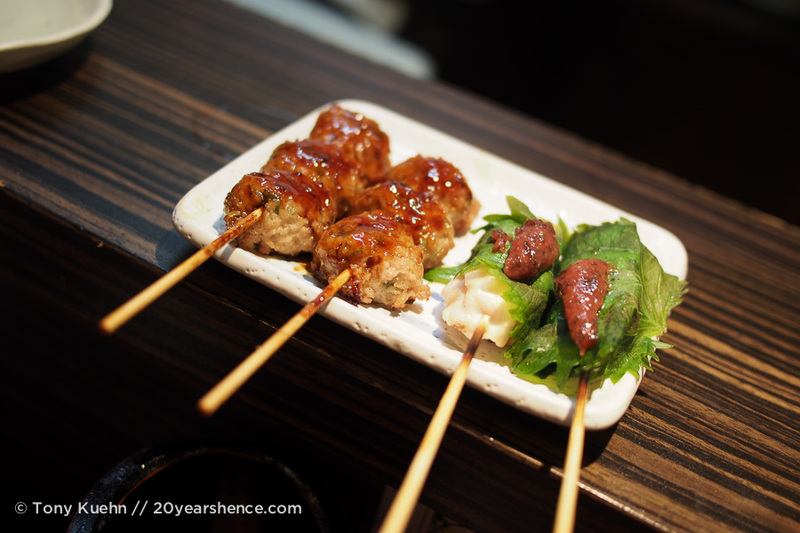 So as not to be complete lushes, we ordered some skewers with chicken meatballs, chicken thigh with Japanese basil & a dollop of plum on top, and some chicken tail. 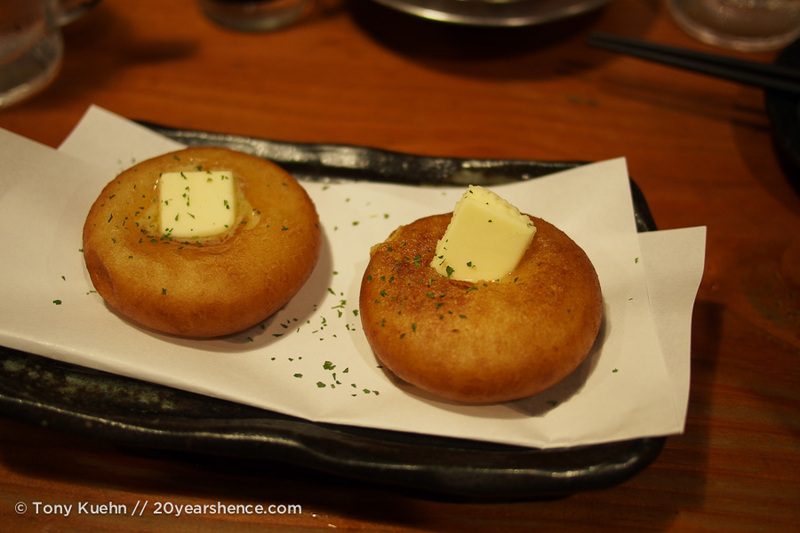 We also asked our chef for his recommendations (“osusume”), which got us a luscious bowl of beef stew and a plate of fried doughy balls filled with chicken pot pie! The food was fantastic, but the meal was made all the more amazing because of the company. We had so much fun chatting with the two guys who run this place as they made us feel so welcome. There really is nothing like chatting with locals when you travel; if you can do it over drinks and a great plate of food, then it’s all the better! Personally, these moments of connecting with strangers and having the world feel a little bit smaller and brighter, these are far more rewarding than any temple or museum ever could be. Having eaten Japanese food almost exclusively during our entire time in Japan, I admit that in Kyoto we succumbed to a few cravings for anything that wasn’t obviously Japanese. Don’t get me wrong: Japanese food is delicious and beautiful, but after a while, it does start to look and taste the same, so we wanted a bit a of variety to wake our tastebuds up. 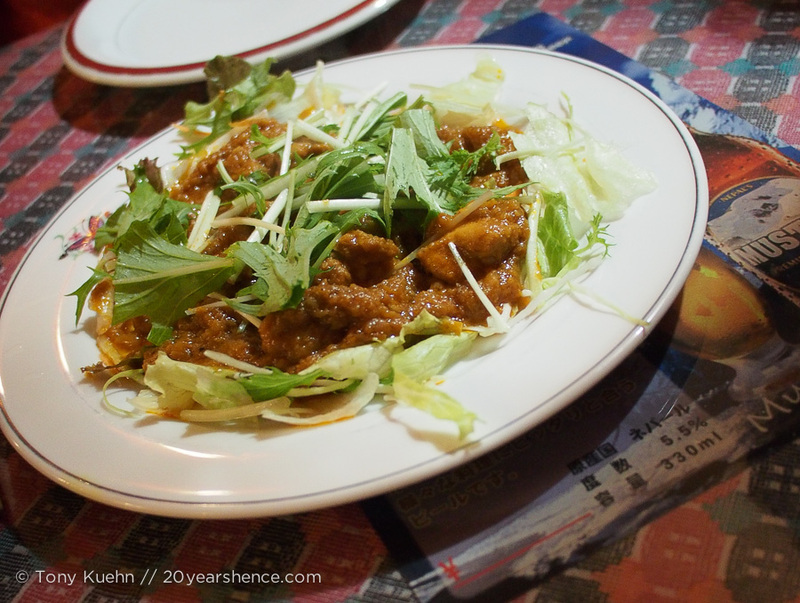 One night after having spent most of the day browsing in the covered Teramachi shopping arcade, we stumbled into a Nepalese restaurant in a fit of rabid hunger. We were so proud of ourselves for branching out and trying something completely different, only to discover that Yak & Yeti has been praised in the Lonely Planet for several years now. So, not exactly off the beaten path, but the food was really tasty. 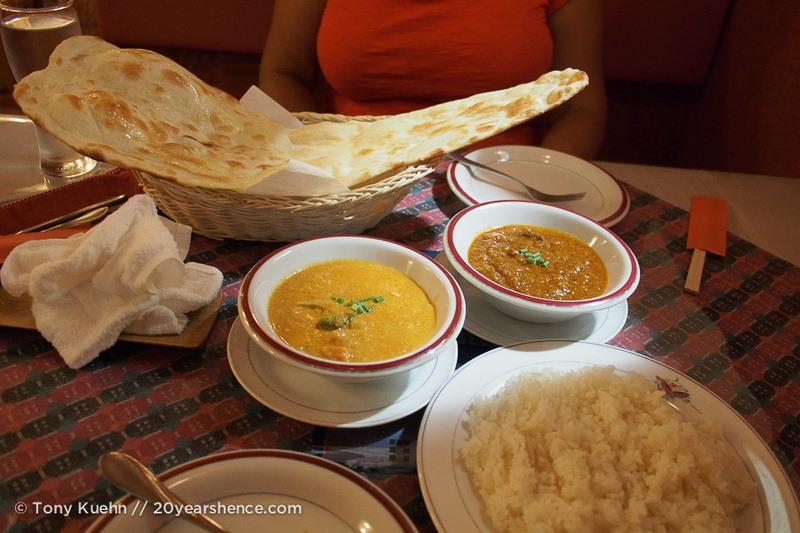 We enjoyed a spicy chicken appetizer, a mutton curry, and a creamy vegetable curry (much like a korma), and the biggest nan we have ever seen. 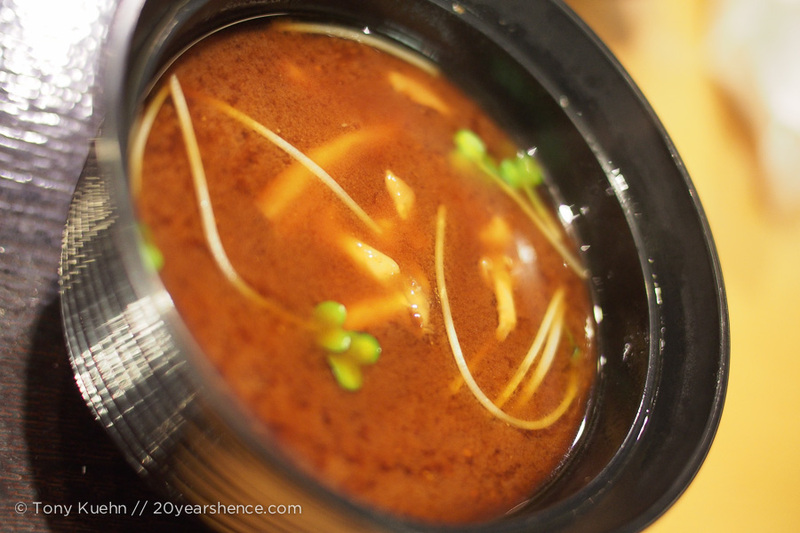 The dishes were all vibrantly spiced and filled our grumbling bellies perfectly, but it also proved that by sticking to local Japanese cuisine, you will pay far less! The one exception seems to be if you venture into the fast food realm. While fast food restaurants aren’t as cheap as making a meal at a convenience store, they can be good ways to keep costs down and are a cultural experience in and of themselves. An interesting juxtaposition, on separate occasions we tried the U.S. import (and international superstar), McDonald’s, as well as the locally developed Mos Burger. 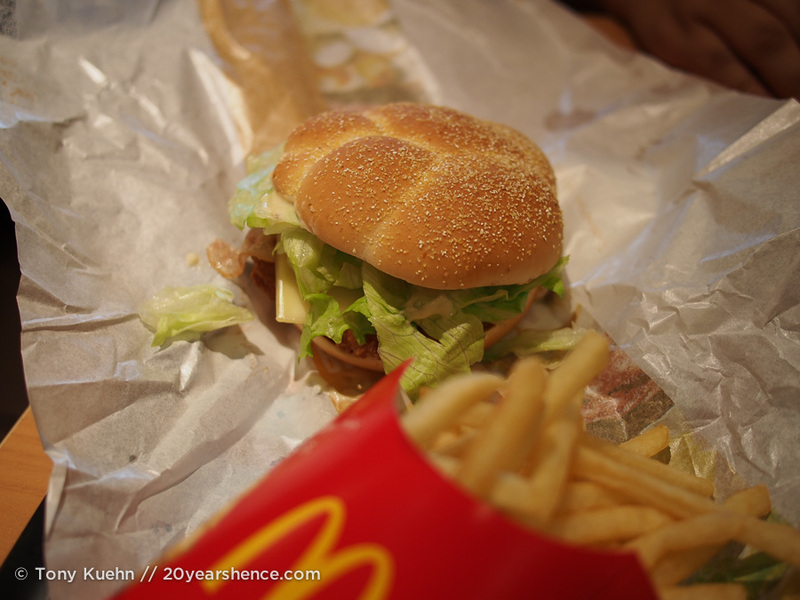 Although Tony and I pretty much never eat fast food back in North America, limiting it to absolute necessity on long road trips, and even then never McDonald’s, I admit that visiting McDonald’s overseas gives me a bit of an illicit thrill. The reason being is that whether you eat there or not, everyone is familiar with the gold standards on a McDonald’s menu, and it is really fun to see how these are warped/adapted to foreign palates. 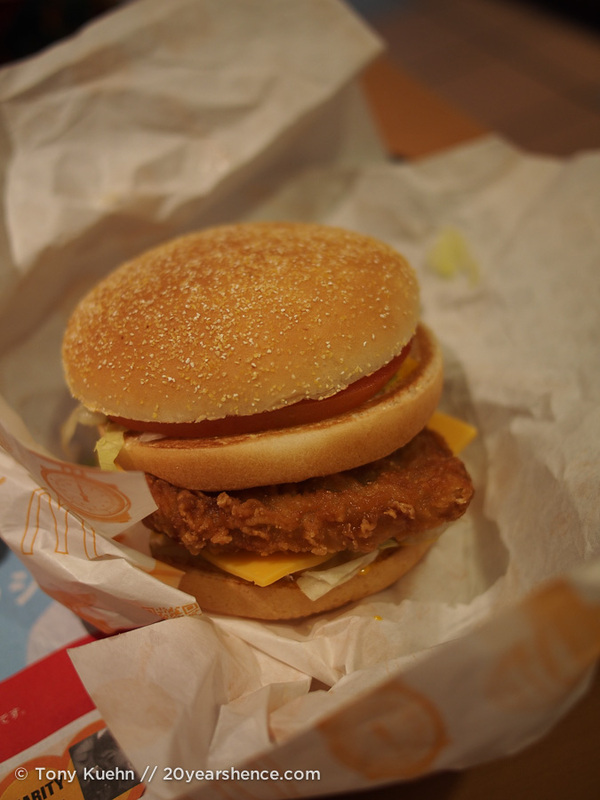 In Japan, we came away with a McChicken and something called a Golden Masala. I admit, the McChicken doesn’t sound like an exciting option, except that the patty was huge and was composed of something that I quite confidently could identify as pure meat! The Golden Masala, was essentially a McChicken, but slathered with a very potent curry sauce, and was meant to be Indian inspired. Fine dining they weren’t, but we found that eating in McDonald’s in Japan was not nearly so repugnant as in its country of origin. 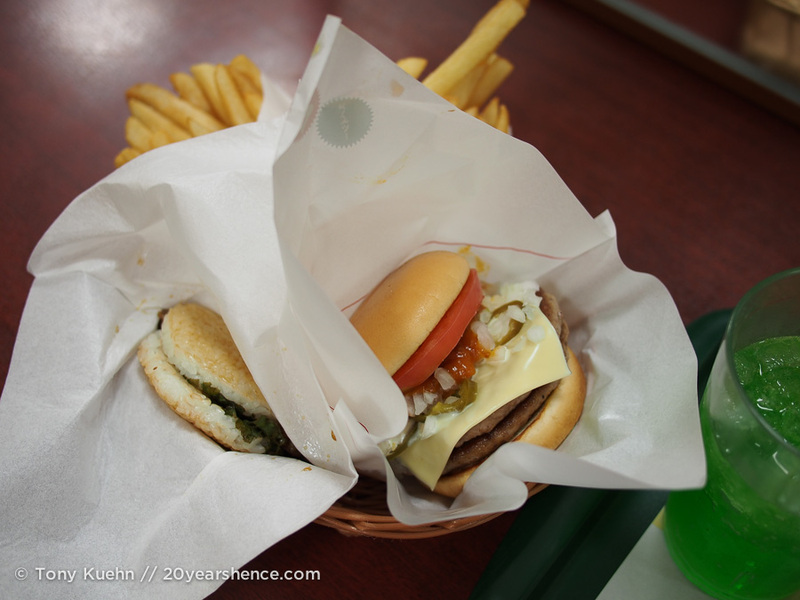 Mos Burger is a Japanese burger chain, which is made immediately obvious when you start looking at their menu. 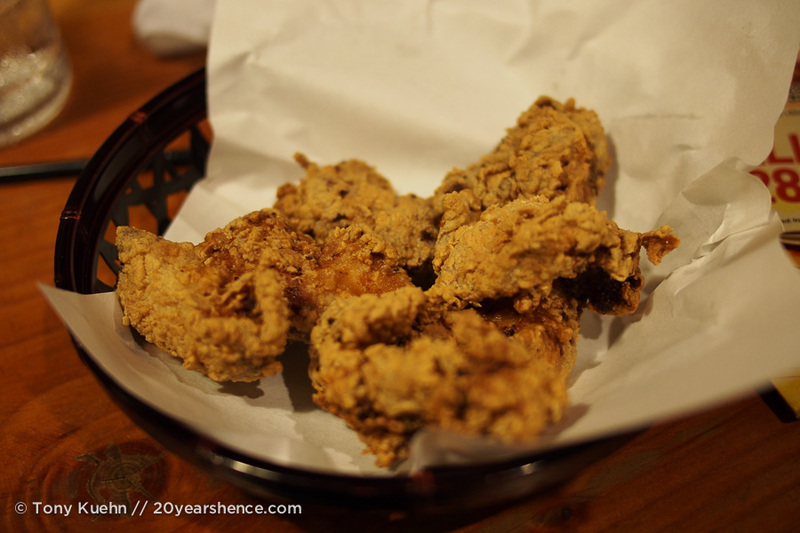 Even with English translations, most of the dishes are fairly mysterious, and we wound up ordering a spicy Mos Burger and a Teriyaki Rice Burger. The spicy burger was really a misnomer, as apart from a sauce that vaguely tasted like chili con carne, it was not the least bit spicy. The burger itself had a really soft, weird texture to it and honestly, just wasn’t very appetizing. The rice burger was actually pretty good, even if I did order it simply for the novelty of having a sandwich where rice patties were substituted in for bread. The meat was tender and well sauced, and worked well with the rice. It tasted an awful lot like some of the stuff you could pick up in a convenience store, but it wasn’t a flop. That said, Mos Burger really wasn’t our thing, and while it was fun to see how the other half lives, I think we’ll leave the shrimp burgers for someone else to investigate! All in all, we had a great time eating our way through Kyoto! I think our time there provides a good cross-section of the cuisine visitors will find throughout the country. It also goes to show that although Kyoto can easily become an expensive destination, it doesn’t have to be, and frugal food options abound for thrifty travelers. Crying Fowl: Does Singapore Chicken Rice Live Up to the Hype? somehow my oatmeal is just not doing it for me this morning. Now I want ramen. I always want ramen, though. It sounds like Kyoto has been good to you! Oatmeal never does it for me! Even with all the miraculous health benefits is ascribed! Honestly, we had a few excellent breakfasts in Japan, but I am really excited for Vietnam where we can have PHO for breakfast! It’s like ramen’s sexier, more aromatic brother! I just had pho for dinner, so I’m at least not AS jealous as usual. I am seriously the pickiest eater, but I still get such a kick out of your food posts. I would probably not eat anything you showed (no seafood and rarely any meat for me), but the dishes are so interesting looking. Mos Burger does NOT sound like a hit. Mos Burger was definitely not a hit! The flavor and texture profiles were just really weird, and while I wouldn’t go so far as to claim it was inedible, it was not a very enjoyable meal! Seriously, this all looks SO GOOD. Michael and I eat a ton of Japanese food, whether it’s ramen or Japanese small plates or sushi, we’re eating it once or twice a month every month. This looks like heaven. I can’t even tell you how jealous I am right now! If you enjoy Japanese food then you really must visit its birthplace as there is nothing like the food as it is prepared in Japan. Everything is elevated to an artform, and even in the lowbrow, humble establishments, the food is impeccable and delicious. We soon learned there was no need to worry about our lack of language skills when it came to food because pretty much everything we ordered was excellent… exceptions that proved us wrong were EXCEEDINGLY rare. I hope you and Michael get the chance to visit & gorge one day! We do our best to document every meal we have, so there will certainly be more pictures in future posts as we eat our way around the world! 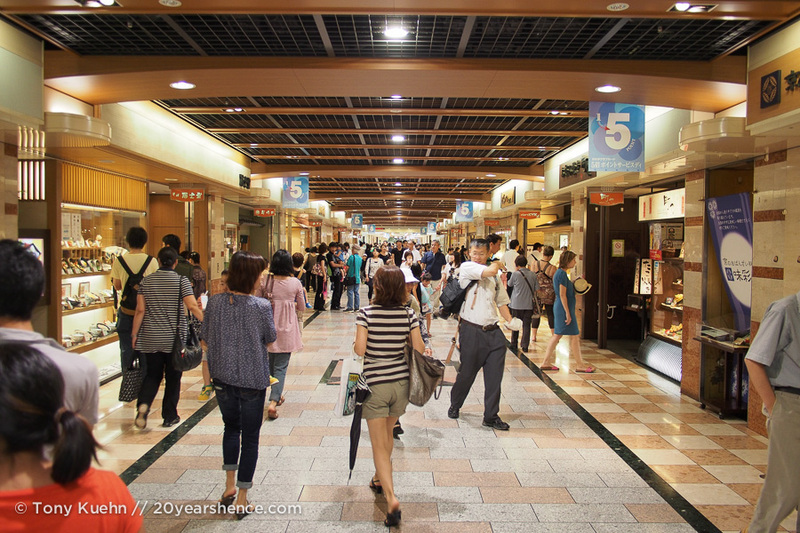 The Kyoto Station underground looks almost like a mall. Mouth watering dishes. I particularly like the chicken skewers. oiishii, ne? Looks delicious! I’ve been trying to get my Japanese food fix here in TO at Guu and it’s pretty authentic (trendy izakaya) but nothing beats the basement/under train station cheap eats! 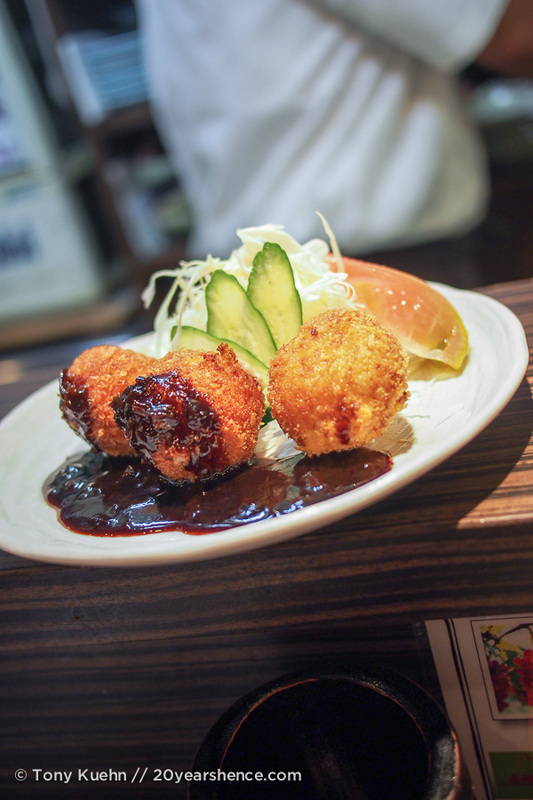 Did you get to try the tonkatsu at the top of the Kyoto department store? We did not try the tonkatsu at the top of any Kyoto department stores (though we did have tempura there), but I think we still got to sample some excellent versions of the dish! I REALLY enjoyed tonkatsu, and if not for Tony restraining me, I might have eaten it every day if I could have! We will have to check out Guu when we return! 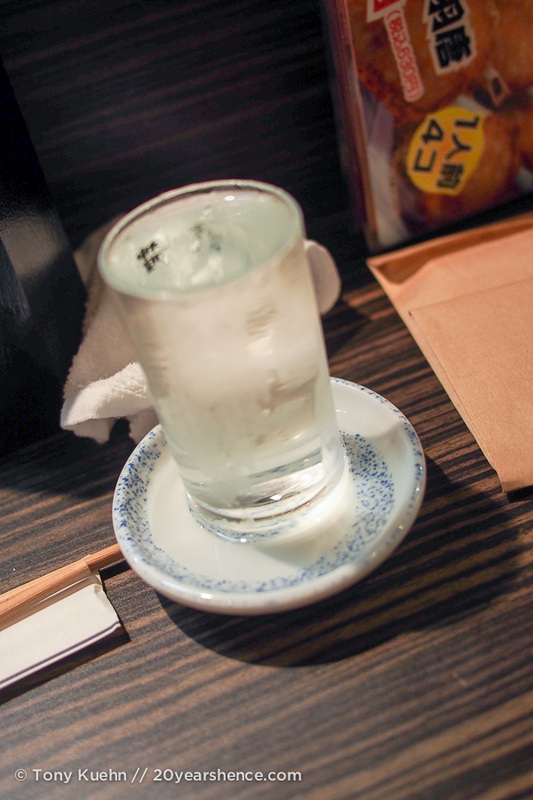 I really loved the izakaya style places in Japan as the food was good and cheap… as was the sake! I admit, the McDonald’s was not a highlight of eating in Japan, BUT it was not as bad an experience as I would expect at McDonald’s. You can definitely do better in Japan, but it was a fun little investigation nonetheless! I would have been curious to try it too, had I been in your place! Amanda recently posted..Readers’ Workouts: A new personal best! Amanda! Great to hear from you! I cannot wait to try Nepalese food in Nepal proper to see how it compares, but this food was definitely very tasty (if pricey! Even for Japan!). I can’t remember what you have tried in terms of Japanese food, but obviously it is far more than just raw fish and seafood. 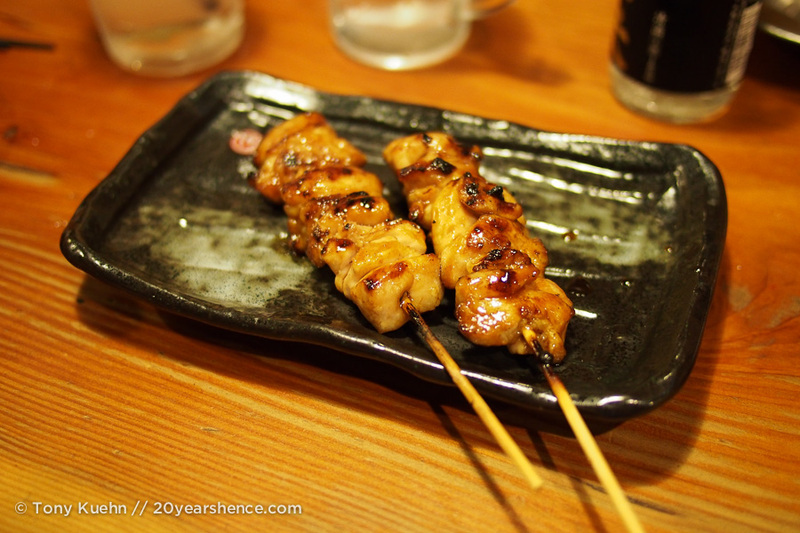 I am sure there are dishes you would like (perhaps some of the yakitori! Or I could see you enjoying ramen a good deal! 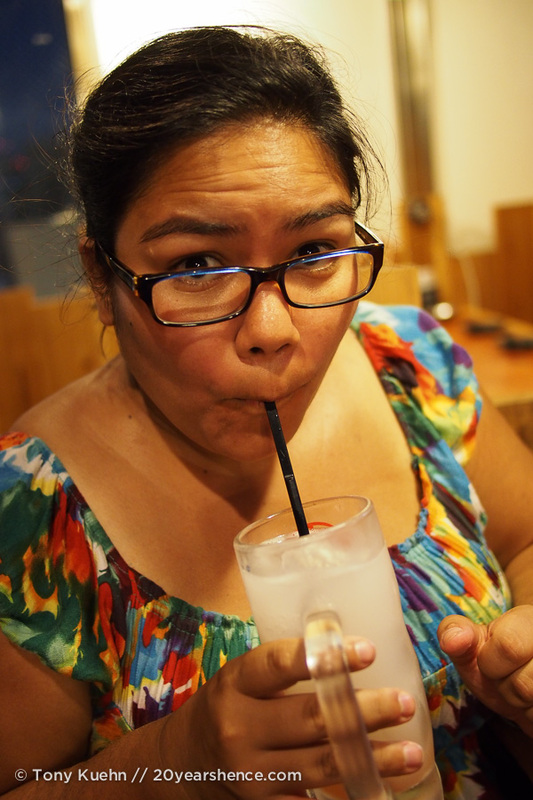 ), but I have no idea what the Japanese food scene is like in San Antonio! 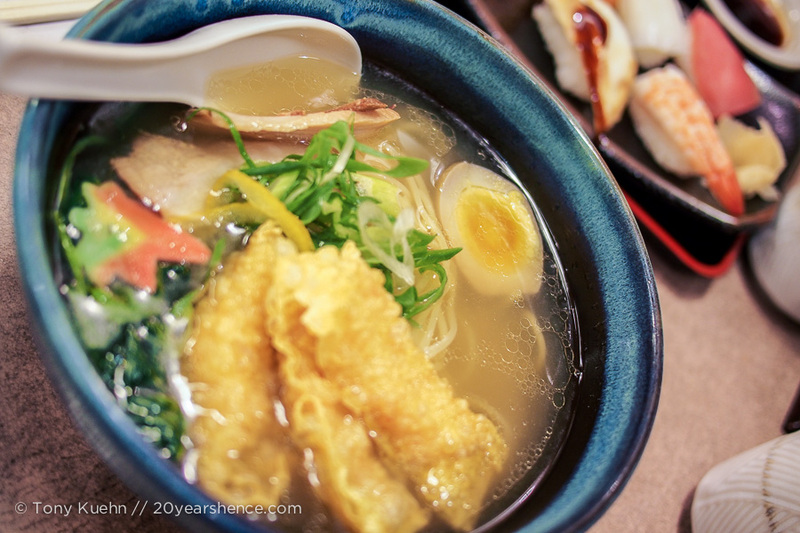 Maybe the next time you are in NYC you could try it there… there are quite a few ramen shops there that I have heard are quite good. And this was just the tip of the iceberg… I am thinking at some point we will have to do a wrap-up post dedicated to all the types of food we tried while in Japan! It was too good to overlook! This food looks ridiculously good! 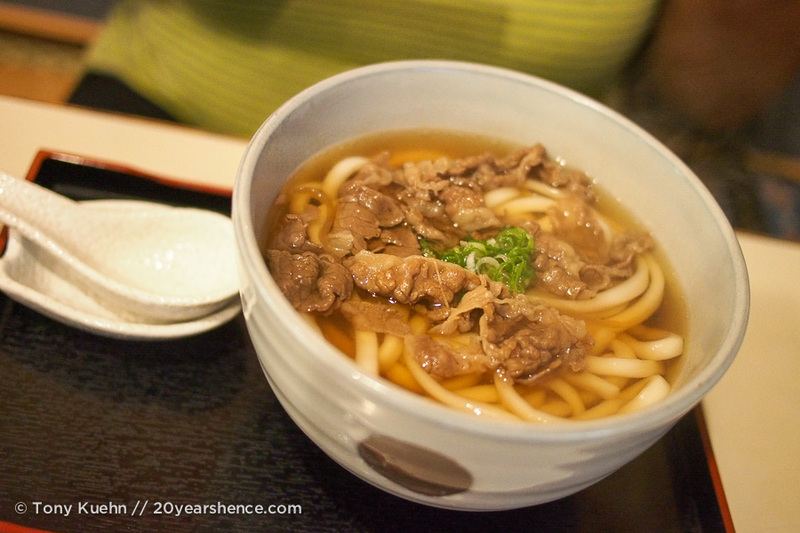 My husband, Tony, and I often plan our travels around food, and we are so sad to have missed out on Japan because we here marvelous things about the food scene there. We also found it so funny how some of the most wonderful food can be found in subways, shopping malls, etc – Definitely not something you would say back in the states! My Tony and I are always planning “foodcations” (as we call them), so the food element has been a huge part of our trip here in Asia! Happily, Japan definitely did not disappoint, and the really nice thing is that there are great meals to delight travelers of all budgets! The presentation of the food is so amazing. I am not a souvenir buyer, but I would be tempted to go overboard buying pretty little serving bowls in Japan. It’s a useful comment you made about the food seeming monotonousness after awhile. Good to think about planning for. Yeah, we really didn’t think that we would get bored with Japanese food, and to be honest, it wasn’t until the very end that we found ourselves craving dishes with a little bit of a different flavor profile… I guess it just goes to show that sometimes you can have a bit too much of a good thing and that variety is the spice of life! My mouth is watering, I love Japanese food! Everything looks good and I’m happy to hear that you “hit your stride” with eating out in Japan because it is so rewarding. mmm…Ramen! Thanks for sharing your great photos. Yes, the lessons we learned about dining out in Japan definitely have served us well since leaving. I think that the first few weeks of traveling in foreign places require us to work on our courage and little tasks that wouldn’t seem daunting back home require reserves of bravery… Thankfully now we feel a lot more confident and are reaping the delicious rewards! OMG I’m drooling. Those chicken rolls sound out-of-his-world-delicious! We are also starting our Big Trip in Japan next February – can’t wait! The food id different espectially the raw egg with tuna . thanks for your suggestions.